The Orchard Road store started seeing a line form on Wednesday afternoon, according to Channel News Asia. By the late afternoon and early evening, the line corrals were in place. Wristbands were being given to line participants, with people afforded an hour break at a time, before sacrificing their place in line. More than one line participant said that they were planning on selling the iPhone X on the internet —or would sell their spot in line if the price was right. Queues began on Wednesday night at other locations as well. 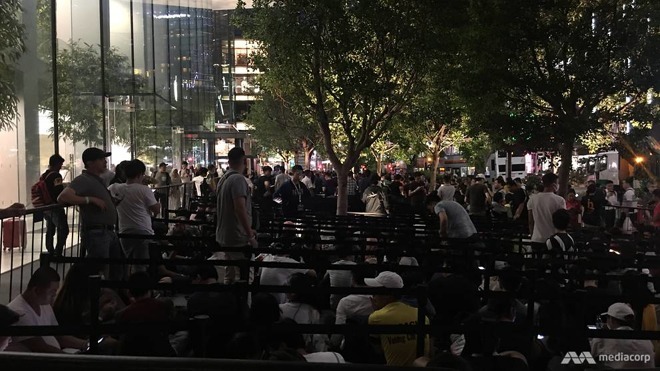 Twitter user Elise Hu reports that there is a line "a block down" from the Tokyo Ginza store. At the Shinsaibashi Apple Store in Osaka, the line extends two blocks, as reported by Kaylee Dayo. The Sydney central Apple store had a large line on October 30, as spotted by Nick Parfene. Dalton King also noted on Wednesday that there were a few fans in line already outside the Palo Alto, Calif. store. Spot checks of several Apple stores on the east coast of the U.S. note that lines have formed either on Thursday morning because of mall security restrictions, or on Wednesday evening in the case of stand-alone stores. Apple announced that there would be a quantity of iPhone X units at retail stores for walk-in customers. It is unclear how many units will be at any given store. There were very few of the iPhone 7 Plus at retail for launch in 2016.